While working on another piece, I came upon the question of how much time is spent at traffic lights, for which there is not a well-sourced answer. I posted to Twitter and got some useful replies. Transport Twitter: What percent of total travel time is spent stopped at traffic lights? Empirical results please. With that and some additional digging, I attempt to answer the question. As the saying goes: Your Mileage May Vary. This depends on your origin and destination and path and mode and time of day and local traffic signal policies and street design. Tom VanVuren notes: “Much of the impact is in slow moving queues, rather than waiting for the signal cycle to complete. I expect you can make this number smaller than 10% (time at the stop line) or larger than 50% (time affected by traffic lights).” For simplicity, I am considering vehicles that would be stopped if they could either move at the desired speed or must stop (i.e. they are subject to “vertical” or “stacking” queues), but clearly measurement will depend on assumption. Still, there must be a system average. I had heard the number 20% bandied about, which feels right, but let’s first begin with some thought experiment, then look for some empirical results. We take different modes in turn. 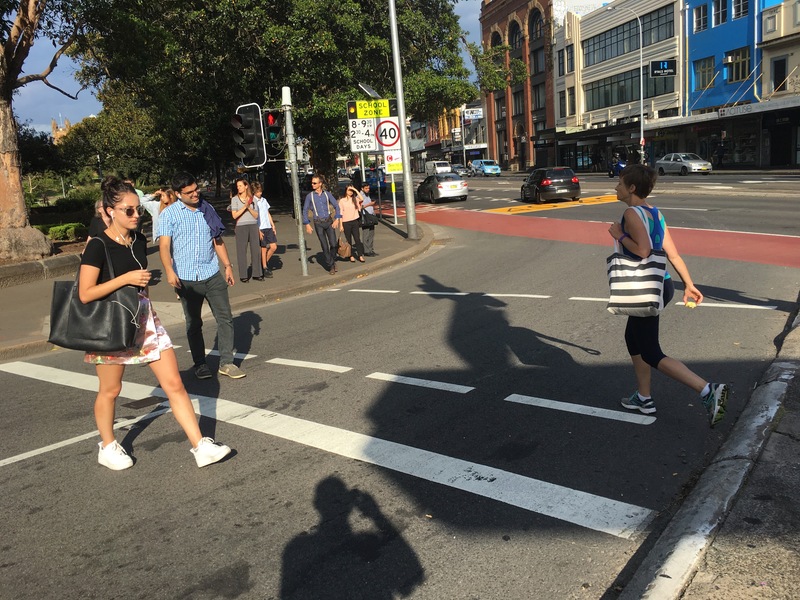 Pedestrian Crossing at Broadway and City Road, Sydney. Pedestrians crossing against the light. Assume 10 signalized intersections per km. Assume each intersection has only 2 phases. Assume fixed time signals at each intersection evenly distributing green time between N/S and E/W directions. So red time = 1/2 cycle length. If a vehicle stops, it waits 1/2 red time. This means that the average vehicle will stop at 5 intersections for 15 seconds each = 75 seconds (or 1.25 minutes) (vs. 1 minute in motion time). In this case, 1.25/2.25 minutes (55.5%) is spent waiting at signals. In this case, the vehicle will stop at 1 intersection per km, for 15 seconds = 15 seconds. In this case 0.25/1.25 = 20% of the time is spent waiting at signals. Now, not all travel takes place on an urban grid. Assume 25% of travel is on limited access roads (this is approximately true in the US), 75% on non-limited access roads. With perfect platooning on the grid, and 25% off-grid, then 15% of travel time is intersection delay with near perfect platooning. Clearly in practice platooning is far from perfect. My guess is the green wave breaks down after one or two intersections during peak times, but can survive well in the off-peak. As a rule of thumb, about ~10% of travel is in the peak hour, ~30% peak period. ~60% AM + PM Peak. Eric Fischer of MapBox was kind enough to offer to run this question on their open traffic data. The results are not yet in. I will update when they are. Which is consistent with expectations that signals are more significant in more urbanized areas (inside the beltway is basically Bethesda and Silver Spring, MD), and with our general estimates. Now of course the speed here is impacted by downstream signals, and so is lower than the speed limit and certainly lower than the free-flow speed sans-signals. More details are in the paper. Moaz Ahmed pointed me to a Vehicle Idling Study by Natural Resources Canada. The percent of time of vehicle idling ranged from 20-25%. (Not all vehicle idling is at signalized intersections). Assume no platooning. (This is probably too severe, a quick pedestrian with some signal coordination can probably make a couple of lights in a row). Here the average pedestrian will stop at 5 intersections for 15 seconds each = 2.5 minutes (vs. 10 minute in-motion time). In this case, 2.5/(2.5+10) minutes (or 20%) is spent waiting at signals. Now, this number is probably true for more pedestrians than the vehicle delay estimate is for vehicles, since pedestrians are more likely to be found on an urban grid and less in a suburban or limited access environment. (Self-selection at work). Assume no platooning. (This is probably too severe, a quick bicyclists with some signal coordination can probably make a couple of lights in a row). In this case the average bicyclists will stop at 5 intersections for 15 seconds each = 2.5 minutes (vs. 3 minute in-motion time). In this case, 2.5/(3+2.5) minutes (or 45%) is spent waiting at signals in an urban environment. Strava, an app for tracking bicyclists and runners can produce some useful data. Andrew Hsu, e.g., reports “28 mile bike commute. 1:30-ish moving time. 10-15 minutes waiting at lights.” From this, for him, we estimate 15 / (15+90) = 14%. To be clear, 1:30 is an extreme commute. I don’t have access to the full database, and obviously this is biased by the nature of the trip. Alejandro Tirachini produced an estimate of travel time for buses finds delay at traffic signals (in suburban Blacktown, Sydney, NSW) is 10-13% of total time.